This article is about the whole territory of the Bailiwick of Guernsey. For the island, see Guernsey. English is the only official language. French used for certain limited legislative purposes. The history of the Bailiwick of Guernsey goes back to 933, when the islands came under the control of William Longsword, having been annexed from the Duchy of Brittany by the Duchy of Normandy. The island of Guernsey and the other Channel Islands formed part of the lands of William the Conqueror. In 1204 France conquered mainland Normandy – but not the offshore islands of the bailiwick. The islands represent the last remnants of the medieval Duchy of Normandy. Initially there was one governor, or co-governors working together, of the islands making up the Channel Islands. The title "Governor" has changed over the centuries. "Warden", "Keeper" and "Captain" have previously been used. The Bailiff stands in for the Governor, or more recently the Lieutenant Governor, if the latter is absent, for a short term or for longer, for instance during the five years of the German occupation of the Channel Islands. The Lieutenant Governor of Guernsey is the Lieutenant Governor of the Bailiwick of Guernsey and, being the personal representative of the British monarch, has usually had a distinguished military service. Originally the local courts in Guernsey were "fiefs" with the lord of the manor presiding. Before 1066, a superior court was introduced above the fiefs and below the Eschequier Court in Rouen and comprised the Bailiff and four Knights; the court heard appeals and tried criminal cases. Otton de Grandson, then the Governor of the Islands, delegated the civil powers to two separate bailiffs for Guernsey and Jersey before he went on crusade to the Holy Land in 1290.:21 This can be assessed as the date of first creation of the two Bailiwicks. Situated around 49°34′00″N 2°23′00″W﻿ / ﻿49.5666°N 2.3833°W﻿ / 49.5666; -2.3833Coordinates: 49°34′00″N 2°23′00″W﻿ / ﻿49.5666°N 2.3833°W﻿ / 49.5666; -2.3833, Alderney, Guernsey, Herm, Sark, and some other smaller islands together have a total area of 78 square kilometres (30 sq mi) and coastlines of about 50 kilometres (31 mi). Elevation varies from sea level to 114 m (374 ft) at Le Moulin on Sark. There are many smaller islands, islets, rocks and reefs in the Bailiwick. Combined with a tidal range of 10m and fast currents of up to 12 knots, this makes sailing in local waters dangerous. The Bailiwick of Guernsey is a separate jurisdiction in itself, and is in turn also three separate sub-jurisdictions. It does not form part of, and is separate from (but is not independent of, or from) the United Kingdom. The two Bailiwicks of Jersey and Guernsey together make up the Channel Islands. The Islanders have never had formal representation in the House of Commons of the British Parliament, nor in the European Parliament. Those Islanders who were not somehow qualified and eligible in their own right to register to vote and to vote in the United Kingdom under the Representation of the People Acts as overseas voters, were excluded from the 2016 United Kingdom European Union membership referendum. A unique constitutional position has arisen as successive British monarchs have confirmed the liberties and privileges of the Bailiwick, often referring to the so-called Constitutions of King John, a legendary document supposed to have been granted by King John in the aftermath of 1204. Governments of the Bailiwick have generally tried to avoid testing the limits of the unwritten constitution by avoiding conflict with British governments. The bailiwick comprises twelve parishes, Alderney, Sark and ten on Guernsey. Each parish has a parish church from the 11th century, with strong religious control exercised initially from the French Catholic church and for the last 500 years from the English church. Over the years the religious aspect of the administration of each parish has been reduced in favour of democratically elected douzeniers. Each jurisdiction has inhabited and uninhabited islands and its own elected government. All three legal jurisdictions need Royal Assent from the Privy Council on its primary legislation. Each jurisdiction raises its own taxation, although in 1949 Alderney transferred its rights to Guernsey. 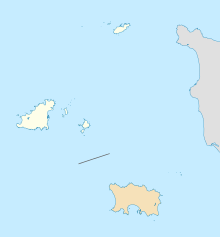 The island of Guernsey has a population of around 63,000 in 24 square miles (62 km2) and forms the legal and administrative centre of the Bailiwick of Guernsey. The parliament of Guernsey and of the nearby inhabited islands of Herm, Jethou and Lihou is the States of Guernsey. With a population of around 1,900 in 3 square miles (7.8 km2), Alderney has its own parliament, the States of Alderney, which has ten elected members and an elected president. From 1612 Alderney had a Judge appointed, with similar judicial powers to a Bailiff; but on 1 January 1949 the island adopted a new constitution, giving up some independence, moving closer to Guernsey and confirming that it is part of the Bailiwick of Guernsey. Sark has a population of around 600 who live in 2 square miles (5.2 km2). Its parliament (together with the inhabited island of Brecqhou) is the Chief Pleas of Sark, with 28 elected members. In 1565, Helier de Carteret, Seigneur of St. Ouen in Jersey, was granted the fief of Sark by Queen Elizabeth I. He received letters patent granting him Sark in perpetuity, on condition that he kept the island free of pirates and that the island was occupied by at least forty men to defend it. Despite most families coming from Jersey, Sark remained within the Bailiwick of Guernsey. There is no flag or coat of arms for the Bailiwick of Guernsey. In historic times, the governor would have used his personal symbols before a generic flag for use by the governor was created. In 1279 Edward I granted a Seal for use in the Channel Islands. In 1304 separate seals were provided to Jersey and Guernsey. The provision of separate seals is one of the earliest indications of the separate identity and personality of the two Bailiwicks. The seal comprised three leopards (or lions), a symbol taken from the original arms of the Duchy of Normandy. The United Kingdom and Her Majesty's Government in the United Kingdom are responsible for the defence and also for formal international, intergovernmental and consular representation of, and the foreign affairs generally, of the Bailiwick. While not a member of the European Union, the Bailiwick has a special relationship with it, under Protocol 3 of the UK's Treaty of Accession 1972 to the European Community. Pooling resources with Jersey, the Bailiwick established in 2010 an office in Brussels to develop the Channel Islands' influence with the EU, to advise the Channel Islands' governments on European matters, and to promote economic links with the EU. The effect of the UK leaving the European Union is uncertain. The UK have confirmed that the Crown dependencies position will be argued in the Brexit negotiations. In 1969 Royal Mail relinquished control of postal services in the Bailiwick, with Guernsey then being recognised by the Universal Postal Union. Since 1999 the Bailiwick of Guernsey has been a member of the British–Irish Council, currently represented by the Chief Minister of Guernsey. ^ Marr, J., The History of Guernsey – the Bailiwick's story, Guernsey Press (2001). ^ Berry, William. The History of the Island of Guernsey. Longman, Hurst, Rees, Orme, and Brown, 1815. p. 213. ^ a b c d e f g "Background briefing on the Crown Dependencies: Jersey, Guernsey and the Isle of Man" (PDF). Ministry of Justice. ^ "Lieutenant Governors". Guernsey Royal Court. ^ Berry, William. The History of the Island of Guernsey. Longman, Hurst, Rees, Orme, and Brown, 1815. p. 186. ^ Wimbush, Henry. The Channel Islands. A&C Black 1924. ^ a b "BACKGROUND INFORMATION ON THE BAILIWICK OF GUERNSEY". Guernsey gov. Archived from the original on 2016-02-15. ^ a b c "About the Bailiwick of Guernsey". Channel Islands Brussels Office. ^ "Jersey Post celebrates the island of Sark". Sepac. ^ "Bailiwick Seal". Guernsey Royal Court. ^ "Channel Islands Brussels Office". ^ "Guernsey". Commonwealth Games Federation.